Brief of presentation : As technology permeates all areas of society, we are awarded with opportunities to a wide range of powerful digital tools that allow us to reinvent educational practices. This session outlines supporting structures that are vital in implementing an approach that is agile, adaptable and equips students with skills to flourish inside and outside of the classroom. Brief Profile : As an individual passionate about both technology and education, Bonolo has obtained a BTech in Information Technology, a postgraduate diploma in education and is currently in pursuit of Master of education in ICT degree. 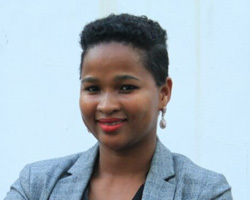 Bonolo developed her technical skills when she worked as an IT technician at the Oprah Winfrey Leadership Academy for Girls before becoming an educator. In her role as a Microsoft Learning Consultant, Bonolo trained teachers on using technology effectively to enhance teaching and learning experiences. Bonolo continues to work in the integration of technology in education as founder and managing director of Moka Learning Technologies.